At a time when the Trump administration seeks to cut refugee admissions to the United States by more than one-half and to bar Syrian admissions indefinitely, the United Nations High Commissioner for Refugees (UNHCR) reports that there are now more refugees than there were at the end of World War II. Several items from the Center for Migration Studies’ (CMS’) archive show that the modern refugee situation also bears comparison to the period before World War II, when non-governmental agencies assisting immigrants dealt with sudden surges of desperate people. 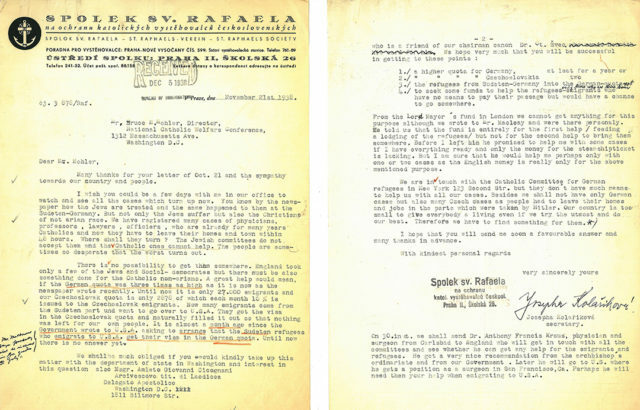 The documents come from the National Catholic Welfare Conference (NCWC) Bureau of Immigration’s file on the Saint Raphael Society for the Protection of Czech Immigrants, a Catholic agency (Saint Raphael is the patron saint of travelers) founded in 1927, seven years after Czechoslovakia itself. Its founder and president was Monsignor Otokar Svec. Its most active employee was its “secretary,” Miss Josepha Kolarik, hired in 1928. In the late 1920s and early 1930s, Czech emigrants came to the capital, Prague, for visas and steamship tickets. The Czech government then referred the emigrants to Kolarik. 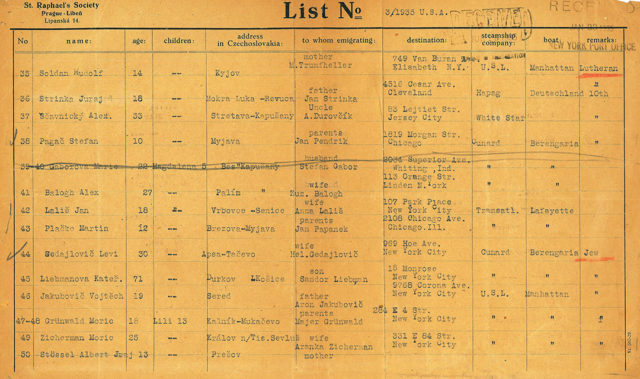 Once an emigrant received a visa, Kolarik entered the person’s name on a list of travelers bound for the United States, along with information as to when that person might sail. The list went to the NCWC Bureau of Immigration’s New York Port Office, so that staff there could meet arriving immigrants, guide them through customs and immigration, and help them to find relatives in New York or to book further travel. Kolarik’s lists indicate something unusual about her work. At the time, most immigrant aid agencies were faith-based charities assisting co-religionists. However, Kolarik’s lists show that the Czech Saint Raphael Society helped persons of many religions. Most Czechs whom Kolarik saw were Catholic, but she also forwarded names of Lutheran or Jewish Czechs to the NCWC, who referred the people to the appropriate faith-based agency. 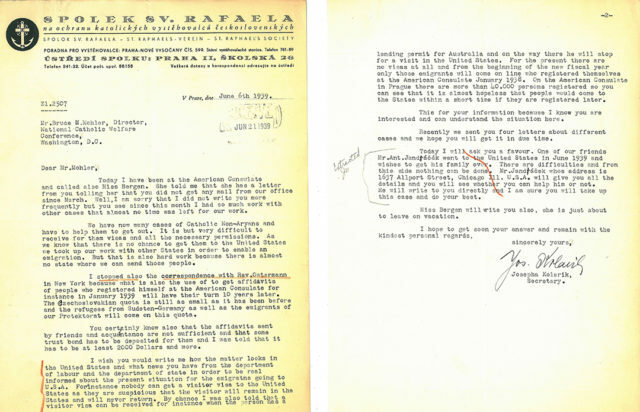 Unfortunately, Kolarik later switched to a system of giving each migrant a card to present to officials in New York to inform them as to which agency to refer the bearer, so it is impossible to know if she continued to work across religious lines. What is clear is that her job became increasingly demanding, and dangerous. In September 1938 Nazi Germany occupied the Sudetenland, Czech territory bordering Germany. With the Nazis came their Nuremberg Laws, which targeted Jews, stripping them of citizenship, limiting their employment and forbidding most forms of contact with “Aryans.” Jew and Aryan were racial, not religious, definitions; thousands of people who thought they were Catholic, because that was the faith they practiced, learned that the Nazis thought they were Jews, and would treat them accordingly. Non-Aryan Christians joined practicing Jews in fleeing the Sudentenland. By November, Kolarik feared that Sudetenland migrants would use all of Czechoslovakia’s available visas. The situation deteriorated. In March 1939, Hitler occupied the remainder of Czechoslovakia. Kolarik could not find visas for all the people that needed her help. No country had visas, especially for refugees. The United States admitted fewer than 3,000 Czechs annually, a number fixed by nativist legislation that aimed to keep racial and ethnic proportions in the United States at 1890 (overwhelmingly northwest European) levels. In June, Kolarik informed her US counterparts that there was a ten-year waiting list for US immigration visas for Czech citizens, and that she would have to consult other countries about receiving immigrants. The work slowed in November, not because the visa situation improved, but because the Nazis had separated Slovakia from the Czech territory, halting the migrant flow. 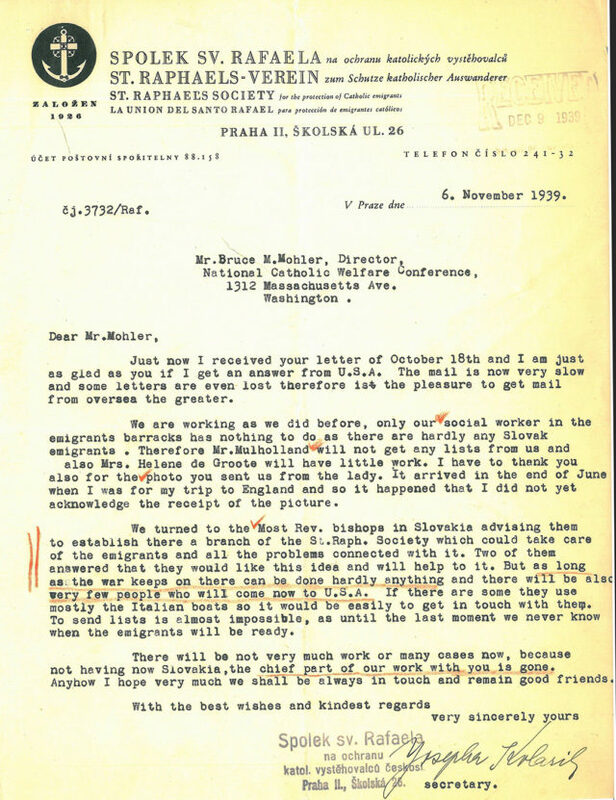 The November 1939 letter was Kolarik’s last before World War II. When the war ended, the Americans learned that the Nazis had suppressed the Czech Saint Raphael Society in June of 1941, and had arrested the leadership. Monsignor Svec survived four years in Dachau. Kolarik died March 28, 1942, as a political prisoner in the Ravensbrück concentration camp.